Can I get a Mortgage with a Low Credit Score? FHA loans can open the door to homeownership, but may come with a higher price tag. The minimum FICO score requirement for a conventional mortgage is 620, but most approved borrowers have scores significantly higher than this threshold. In fact, the average FICO credit score for an approved conventional purchase mortgage is 752 as of January 2017. If you don't have rock-solid credit, however, that doesn't necessarily mean you can't buy a house. Thanks to FHA mortgages, borrowers with shaky credit could become homeowners and without a massive down payment. As of this writing, the minimum credit score required for an FHA mortgage with 3.5% down is 580. The down payment can come from a gift or other funding method -- it doesn't necessarily need to be from savings. Furthermore, if your credit score is less than 580, you could still qualify for an FHA mortgage, but with a higher down payment. In fact, with a 10% down payment, credit scores as low as 500 are allowed. And because the mortgage is insured by the FHA, the interest rate you get will be competitive with the market average, even with a low credit score. As of 2017, the FHA maximum loan limits for single-unit homes range from $275,665 to $636,150, depending on where the home is located, and you can find your limits on HUD's website. The loans are available on properties with one to four units, and higher limits are allowed for multi-unit properties. 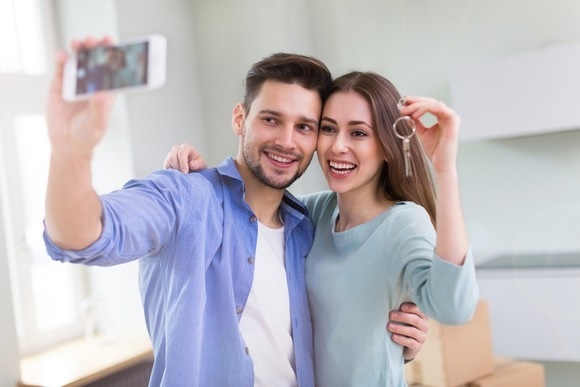 In fact, one popular strategy to lower housing costs involves buying a duplex, triplex, or quad, living in one unit, and renting out the others.